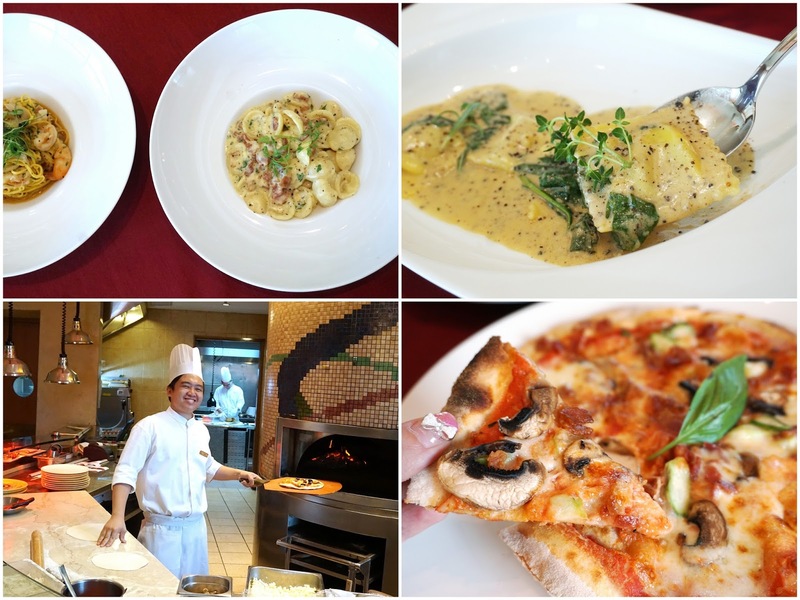 PinkyPiggu: Pontini Italian Restaurant @ Grand Copthorne Waterfront Hotel ~ 5 Reasons To Go For Their Semi Lunch Buffet! Antipasti (meaning "before the meal" in Italian) refers to the starters of an Italian meal. Looking at the variety that Pontini offers, it can very well fill up a petite appetite before we even get to the mains. The counter spread consists of an assortment of Italian Cold Cuts, Handmade Bread and Breadsticks, a variety of Salads including Octopus, Marinated Italian Baby Mushroom in parsley, garlic & olive oil (which I enjoyed tremendously), Home-cured Scottish Salmon, Anchovies, Olives, Frittata, Chilled Oysters, Chilled Tiger Prawns and much, much more. Cheese lovers, do not miss the "Cheese Room" which houses an array of hard and soft artisanal Italian cheese like Black Truffle Pecorino, Burrata, Parmesan, Mozzarella. 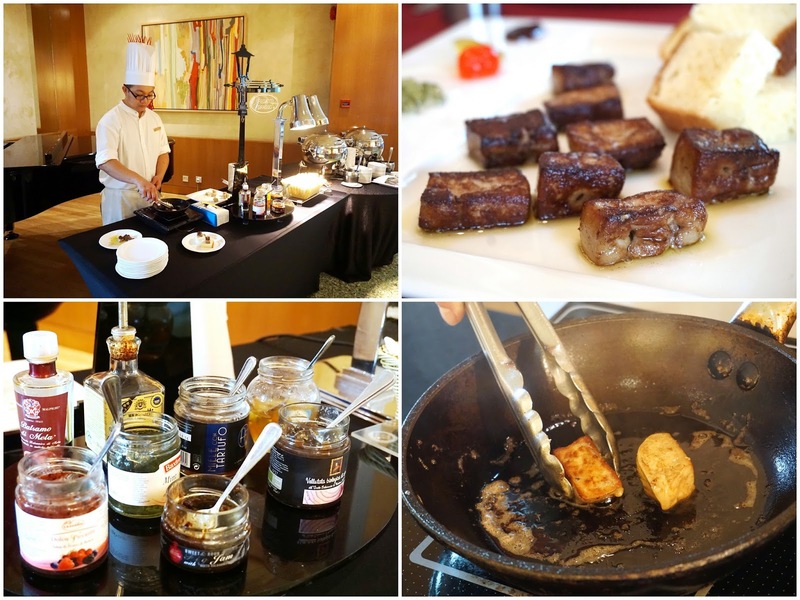 I was sooooooo excited over the FREE-FLOW of PAN-SEARED FOIE GRAS that I told my friend I want to park myself next to the live cooking station and gorged myself silly hahaha. But seriously, who wouldn't appreciate foie gras that are of premium quality and seared ala-minute to luscious goodness? I'm glad that Pontini did not sacrifice quality even though this is part of the buffet offering by using higher-costing goose liver instead of the cheaper duck liver. Best enjoyed with some brioche and fruit chutney by the side. Another part of the buffet which really impressed us was the Pasta & Pizza which we can customized to our preference. Just a simple indication of our choices on the order chit provided, and the food came out of the kitchen fresh and piping hot soon after. Standouts include Wagyu Cheek Ragout which we paired with Tagliatelle, Premium Cheese Fondue with Ricotta & Spinach Ravioli and Sautéed Prawns & White Asparagus in lemon-flavored sauce with Tagliolini. Not only are the sauces lip-smacking good, the al-dente texture of the pastas were perfectly spot-on! We ordered 2 pizzas and were surprised by the generosity of each portion. There are 15 toppings such as pancetta, salami, shredded chicken, smoked salmon, artichokes, capers, mushrooms and green zucchini which you can choose from to design your own unique creation. There are a total of 5 main courses for our selection. My favorite was Roasted New Zealand Lamb Rack which pleased greatly with its medium-rare tenderness, and there was no gamey flavor at all. Served with roasted baby vegetables, celeriac & truffle mousse and grain mustard sauce. Other mains include Pan-seared Norwegian Salmon Fillet, Tuscany-style Mixed Seafood Soup, Braised Short Ribs and Roasted Spring Chicken from the rotisserie. Lastly, my advice is paced yourself and not go overboard with the food above because there is an array of desserts lined-up to end off your meal on a sweet note. 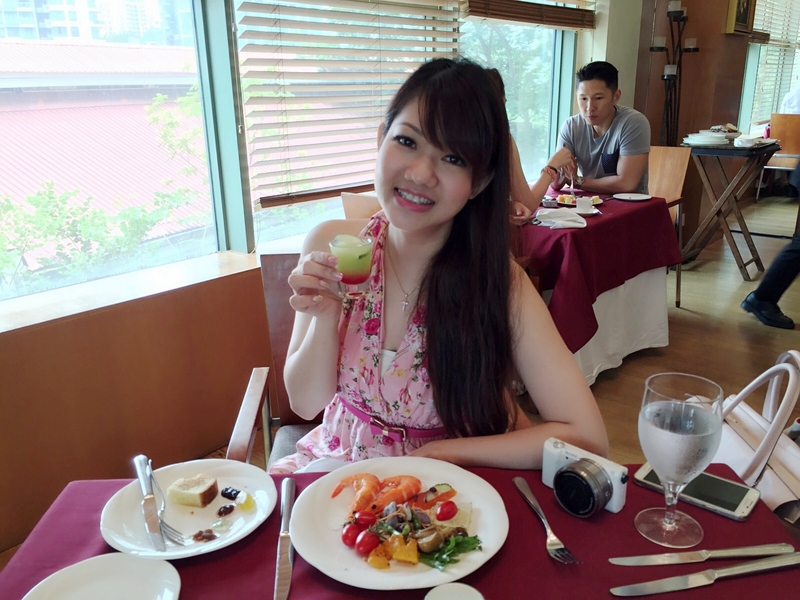 Well, you can start off the buffet with desserts too if you want haha! 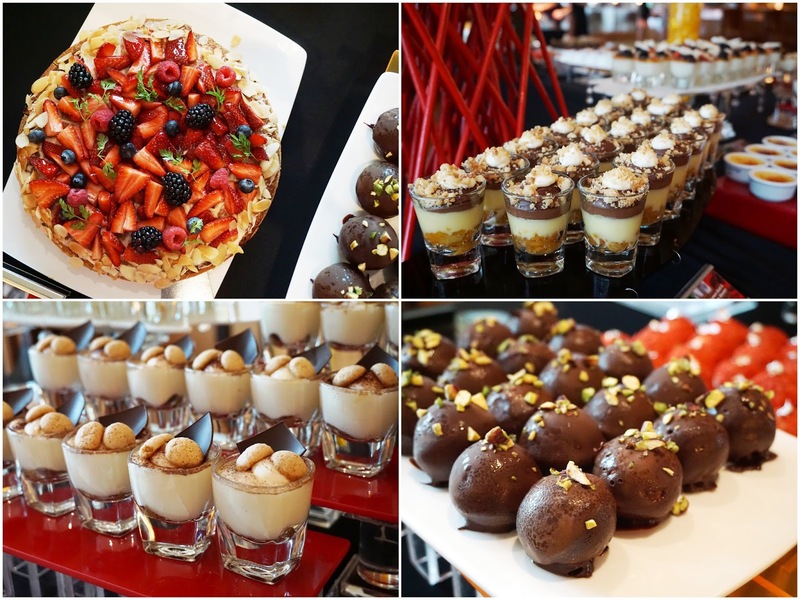 Highlights include Chocolate Balls, Raspberry Profiteroles, Chocolate with Lemon Curd & Apricot Compote Shooter, Vanilla Pana Cotta with Fresh Berries, Tiramisu, Creme Brulee, as well as a variety of Cakes and Macarons. We were asked how Pontini can improve on this semi lunch buffet. I thought for quite a while because everything was quite faultless really. So in the end I said, "please extend the buffet duration. 3 hours is not sufficient for me to have enough of the delicious food". Haha! 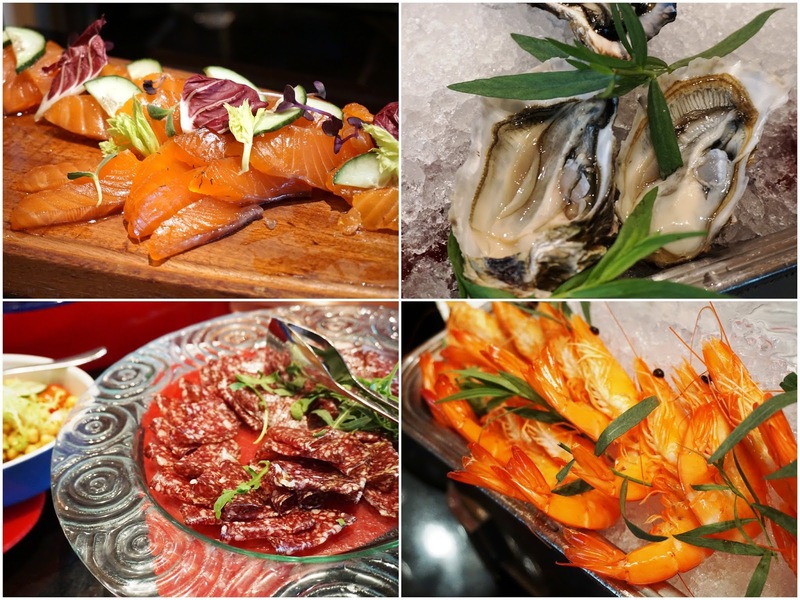 Pontini's Italian Semi Lunch Buffet is available on Saturdays and Public Holidays, from 12pm to 3pm. Price is at $58 for Adults, and $29 for Child.